Thermo sensor WRN-035, K, -50°C + 400°C, Ф5mm, length 100mm Temperature sensor WRN-035, with temperature range -50°C - 400°C, probe diameter Ф5mm and probe length 100mm. Thermistor PT100, 0-200C, F15MM, 100MM long, armored Pt100 termal resistor type probe with 15 mm working diameter and 100 mm length, temperature range 0 ° C to 200 ° C. It is connected via a 1 m long duct armored cable. Thermocouple K, TUBE -100 °C -400 °C, Ф6 mm, length 50mm Thermocouple К, with temperature range -100 °C to 400 °C,probe diameter 6 mm and length 50 mm. Thermistor Pt100, 0 ° C -250 ° C, Ф7 mm Thermistor Pt100, with temperature range 0°C to 250°C,probe diameter 5 mm and length 200 mm. Thermistor Pt100, 0 ° C -250 ° C, Ф8 mm Thermistor Pt100, with temperature range 0°C to 250°C,probe diameter 8 mm and length 200 mm. 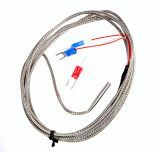 Thermistor Pt100, TUBE 0 °C -200 °C, Ф4 mm, length 30mm Temperature sensor Pt100 with working part diameter 4 mm and length 30 mm,temperature range from 0°C to 200°C.Three-wire armored cable connection with lenght 2 m.
List Price 19.00лв. VAT Incl. 18.04лв. VAT Incl. 17.10лв. VAT Incl. 16.14лв. VAT Incl. Thermistor Pt100 TUBE 0 °C -200 °C, 5 mm, length 30mm Thermistor Pt100,with operating temperature range 0°C -200 °C and probe diameter 5 mm. Thermistor Pt100, SCREW 0 °C -400 °C, M6 14mm Temperature sensor Pt100 with working part diameter 4.5 mm and length 3 mm, temperature range 0°C to 400°C.Three-wire armored cable connection with length 2 m.
List Price 21.90лв. VAT Incl. 20.80лв. VAT Incl. 19.71лв. VAT Incl. 18.61лв. VAT Incl. 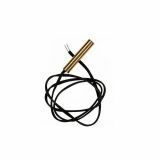 Thermistor probe, Pt100, TUBE, 0-400 °C, M8, 25mm Thermistor probe type Pt100 with diameter of the probe 6 mm and length of 25 mm. The thermocouple has a temperature range from 0 ° C to 400 °C. Connects via three-wire , armored cable with a length of 2 m. The mounting thread size is M8. List Price 19.90лв. VAT Incl. 18.90лв. VAT Incl. 17.91лв. VAT Incl. 16.91лв. VAT Incl. Thermocouple Pt100, VPT-S, 0 ° C - 400 ° C, Ф5 mm Thermocouple Pt100, VPT-S,with operating temperature range 0°C to 400°C and probe diameter 5 mm. Thermocouple Pt100, WZPT-03, 0 ° C - 400 ° C, Ф5 mm Thermocouple Pt100, WZPT-03,with operating temperature range 0°C to 400°C and probe diameter 5 mm. Price 15.33лв. VAT Incl. 14.57лв. VAT Incl. 13.80лв. VAT Incl. 13.03лв. VAT Incl. List Price 21.90лв. VAT Incl. 20.81лв. VAT Incl. 19.71лв. VAT Incl. 18.62лв. VAT Incl. Thermistor Pt100, from 0°C to 500°C, Ф12mm, length 100mm Thermistor type Pt100 with working part diameter ф 12 mm and length 100 mm,temperature range from 0°C to 500°C. List Price 63.00лв. VAT Incl. 59.85лв. VAT Incl. 56.70лв. VAT Incl. Thermistor Pt100, VPT-H, from -200°C to 500°C, Ф10 mm. Thermistor Pt100, VPT-H, with operating temperature range from - 200°C to 500°C and probe diameter 10 mm. Thermistor Pt100, -70° C - 200° C, Ф8 mm Thermistor Pt100,with temperature range -70° C - 200° C and probe diameter 8 mm. Thermistor Pt46, 0 ° C - 300 ° C, Ф8 mm Thermistor Pt46, with temperature range 0 ° C - 300 ° C and probe diameter 8 mm. List Price: 15.00лв. VAT Incl. Thermocouple DS18B20, -55ºC to +125ºC, Ф6mm, 3m Thermocouple DS18B20, with operating temperature range from - 55 ºC to + 125 ºC. and probe diameter: 6 mm. Thermocouple J, TUBE 0 °C -400 °C, Ф4 mm, length 30mm Thermocouple J, with temperature range 0°C to 400°C,probe diameter 4 mm and length 30 mm. List Price 9.90лв. VAT Incl. 9.40лв. VAT Incl. 8.91лв. VAT Incl. 8.41лв. VAT Incl. Thermocouple J, TUBE 0 °C -400 °C, Ф5 mm, length 30mm Thermocouple J, with temperature range 0°C to 400°C,probe diameter 5 mm and length 30 mm. 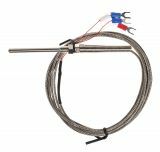 Thermocouple J, SCREW 0 °C -400 °C, M8 12mm Temperature sensor J with working part diameter 4.5 mm and length 2 mm, temperature range 0°C to 400°C.Two-wire armored cable connection with length 2 m.
List Price 9.90лв. VAT Incl. 9.41лв. VAT Incl. 8.91лв. VAT Incl. 8.42лв. VAT Incl.